The Centro Financiero Confinanzas (a.k.a. 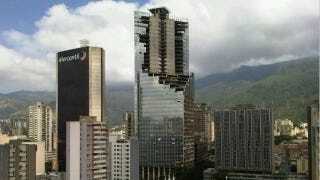 "the David Tower," named after its investor David Brillembourg) stands half-complete in downtown Caracas and is Venezuela's third largest skyscraper. A beauty salon operates on one floor. On another, an unlicensed dentist applies the brightly colored braces that are the rage in Caracas street fashion. Almost every floor has a small bodega. Julieth Tilano, 26, lives inside a small shop on the seventh floor with her husband and in-laws. They sell everything from plantains to Pepsi and Belmont cigarettes. Her husband, Humberto Hidalgo, 23, has a side business in which he charges children from the skyscraper 50 cents per half-hour to play PlayStation games on the four television sets in the family's living room. "There's opportunity in this tower," said Mr. Hidalgo, who immigrated here last year from Valledupar, Colombia. For another massive abandoned skyscraper, see the Sathorn Unique in Bangkok, Thailand.